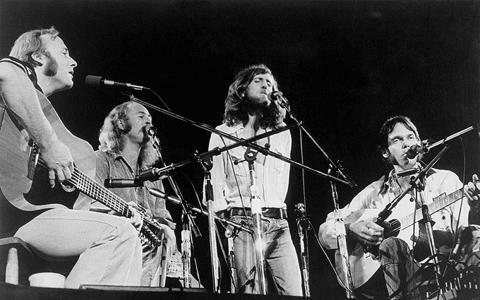 Throughout their various tumults , whether it be over creative or personal differences, drugs or missed musical opportunities: Crosby Stills Nash and Young have still managed to develop a discography of impressive songs, even if they’ve only erratically come together as one unit. While this output has been inconsistent and somewhat limited at times, the discography of the four principal members, solo and together contains significant pieces of music that are vital elements to seeing the entire image developed from their collaborations. Regardless of their numerous battles, one must get past the insults, the erased tracks, the destroyed sessions and public arguing to examine the music ...the only thing that should really matter. Today in the 'rock room', I will gaze beyond the silhouettes of massive hits bobbing on the surface of their respective careers, well known songs that have seeped into rock history like 'Ohio”'and 'Our House.' but also beyond the constraints of the three studio albums created over 45 years....because there is more music to be had. There remain songs that are only nestled on the flip sides of solo recordings that contain input from all four principal members. Diving even deeper into the blue depths of history, we can find unreleased takes of familiar songs, which due to stubbornness and miscommunication never became an official Crosby Stills Nash and Young release. “THROUGH MY SAILS,” (ZUMA, 1975): The closing song on Young’s 1975 album with Crazy Horse, “Through My Sails” is a perfectly encapsulated Crosby Stills Nash and Young moment. The CSN vocal blend elevates the ocean sway of the track up and through the clouds, making it one of the quartet’s finest moments on tape. They are accompanied only by light percussion, acoustic guitar, leaving the vocals feeling naked, pure and real. It’s woody respite from the electric music from Crazy Horse that came before, and is representative of the relief nature provides after a bright, all night bender in the fast lane. 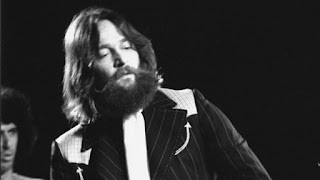 “SEE THE CHANGES,” (CSN, 1991): Originally in the running for the unreleased early-1970s Human Highway project, an updated take on “See the Changes” ultimately appeared on 1977’s CSN. This earlier version, however, was recorded in the studio by Crosby Stills Nash and Young in 1973, training a new spotlight on one of Stills’ most honest and true lyrical creations. In contrast to its more laid back officially released counterpart, the 1973 edition road trips on silvery rapt acoustics and slightly rough-hewn vocal blends. A hint of sadness prevails, however, since this version could have become a vital piece in an unrealized CSNY full-length. “PUSHED IT OVER THE END,” (Italian import b-side, 1974): Considered by many to be the great lost CSNY track. A smoky umbrageous song with differing movements, the lyrics deal with Young’s deteriorating relationship with Carrie Snodgrass. Reaching past seven minutes, “Pushed It Over the End” opens like a junkie waltz, balanced precariously on Young’s razor sharp Les Paul stabs. The clandestine trap door then falls out from under the performers amidst a wash of feedback, exposing the classic Young melody residing at the center which CSN drape their lacy veil of harmonies. The extended soloing over the jerking groove mid track is essential listening. Set aside for a discussed and unrealized early-1970s Crosby Stills Nash and Young project, “Pushed It Over the End” made a few extended appearances during the 1974 concert tour. Unreleased in the states, “Pushed It Over the End” actually did appear on a pricy Italian-issued box set of Young albums. That version hails from August 27, 1974, and contains some vocal additional studio touch ups. “SOMEDAY SOON,” (LOOKING FORWARD, 1999): Coming from the group’s last studio offering, 'Someday Soon' harkens back to the heady days of Crosby Stills Nash and Young, eliciting all of the elements that make the group so special. Penned by Graham Nash, the acoustic mid-tempo song highlights Nash’s innate ability to compose melodies for the ages. All four members appear and are invested in the song, revealing the band’s recognizable fingerprint of quality vocal arrangements, empathetic instrumentation and damn good songs. Stills and Nash’s harmonizing on the middle eight seems to sum it all up for me. It’s chill inducing and awe inspiring. 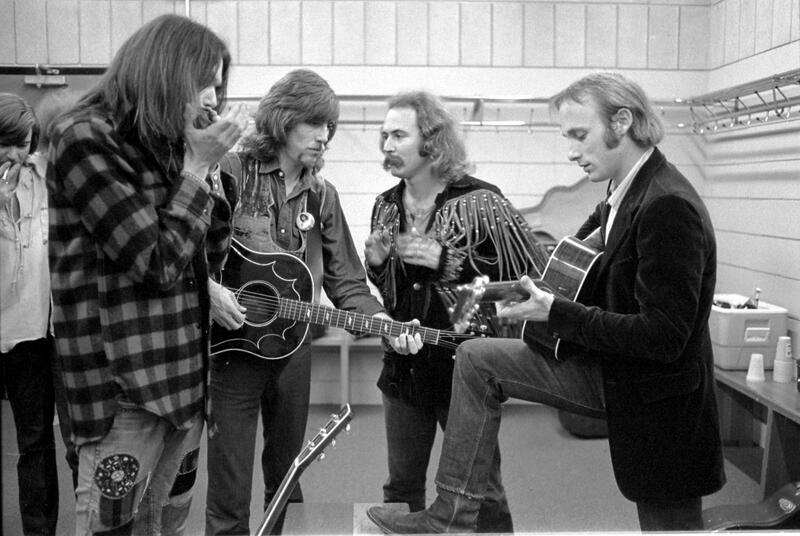 This truncated list is only a sampling of the prolific and unique musical creations developed by Crosby Stills Nash and Young. There are numerous songs that meet the criteria to be included in this list of rare tracks. I simply tried to distill it down to a reasonable number, representing all eras. 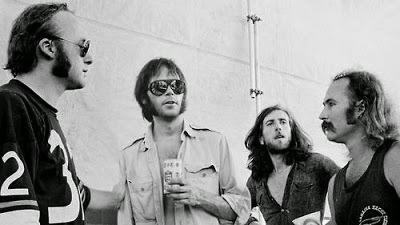 As mentioned, there is an entire album tentatively titled Human Highway that contains CSNY songs that were never fully developed in the studio, though many of those songs stretched their legs in concert appearances. What this list does illustrate is that regardless of the temperament and condition of the principals, the music could slice through the thick pretense and always deliver the goods. Whether or not the musicians could notice the magic themselves at the time is irrelevant, because the sonic gifts have been captured for eternity for all to enjoy.